Today we decided to dive into our new unit on the human body! We're reading books about the body, drawing up our own life size bodies, watching movies about the body and trying out some fun hands on activities to go along with it all. Today my boys wanted to focus on digestion... and mix up some fake puke. What can I say? Boys seem to have a warped sense humor. We ended up starting our day watching DisneyNature Migration. We learned all about different animal migration, reasons animals migrate and how migration affects their lives. While watching the boys used the Magnet blocks to build different creations. Evan sorted the blocks by color and size and made sure that he had 5 triangles of each color and then put them together in order. The older boys worked together to build a super, complex, house. They went on to design and redesign the house many times and Evan started delivering the blocks to them on the toy forklift. the whole building and all it's features. keep the snow off of the cars and people below. The boys all laid down on craft/ drawing paper this morning and let me trace their bodies onto paper. 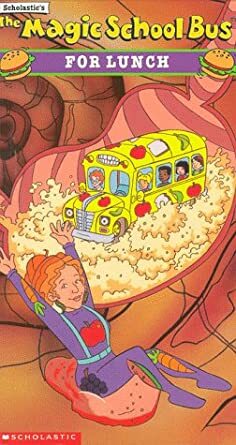 I pulled out the Magic School Bus Inside the Human Body book and showed them the huge diagram of the human body that the class worked on and I explained that over the next few weeks they'll be making their own human body. We read the book and got a good overview of the entire inside of our bodies. 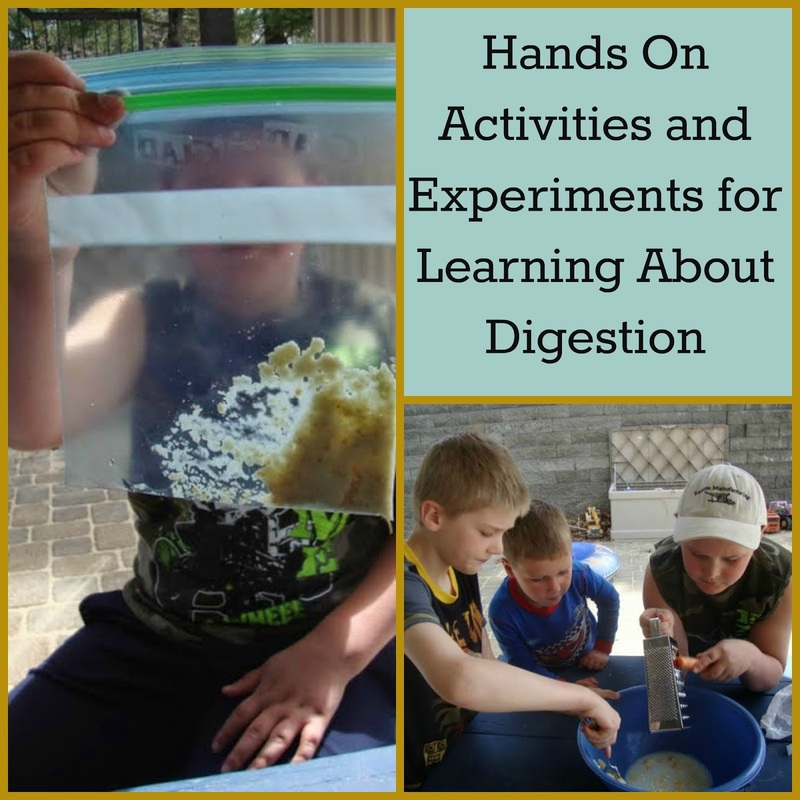 The boys wanted to focus on the stomach and digestion for today so we watched "The Magic School Bus for Lunch" and then did a few hands- on activities. We digested a cracker in "stomach acid"-- using a Ziploc baggie the boys each crushed up a cracker or two just like the teeth break down our food. We then added just a bit of water like our saliva and saw how it made our food into a paste that could be easily swallowed. We then added lemon juice (though I read several digestion activity guides and found some teachers use sprite, some use orange juice, some use vinegar so pretty much anything acidic). Once we added our juice which works like our stomach acids we continued to kneed the bag like our stomach muscles and saw how the crackers just about dissolved. You could take the activity further and bring the food into the intestines as many teachers do using pantyhose and oatmeal but since the boys really wanted to make our own puke we stopped this activity for today. I really DID not want to do this activity. As you may know from previous blog posts I'm a total wimp when it comes to this kind of stuff . Making fake puke that looks (and I was warned even smells!) like the real thing was making me queasy just thinking about it. Luckily it was a beautiful, sunny day and I suggested we move this activity outside. It was so gross but the boys LOVED it. They all assured me it didn't smell THAT bad but I refused to even take one small sniff. We poured it out in the woods and went back inside. I then helped the boys find and draw the esophagus & stomach onto their bodies. They thought about where their mouth would be, how big the esophagus probably is and where they thought their stomach would be by comparing their drawn bodies with that of the one on the worksheet. They did a pretty good job too. We ate lunch outside while reading the first two chapters of our new Harry Potter book. We stopped a few times; like when the 5 helicopters flew overhead and we wanted to watch them or the time when the two little black birds were diving at the hawk flying over head and we remembered a guide at the Ecotarium telling us about how small birds will gang up on the birds to prey to try and scare them away from their nests. We enjoyed the story very much and the boys realized that a lot of details are being left out of the movies. The boys begged to be allowed to go swimming since it was near 80 today. I agreed to let them go swimming and they spent the next three hours playing in the water. They fished using nets and bread and caught a ton of fish; some pretty big ones too! They swam, jumped, snorkeled and used swim flippers on their feet. They pretended they were scuba divers, Poseidon, demi gods and gods, and anything else that struck their fancy. Alec remarked that it was harder to swim with fins on and asked me how scuba divers do that. It was such a perfect day. Thank you; I sure hope so.